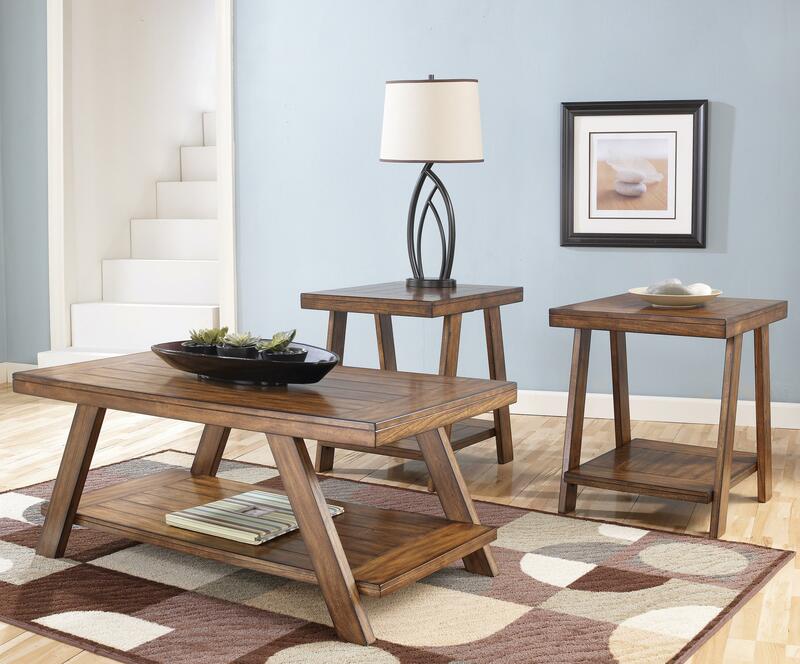 Using a warm finish and a rich rustic design, the Bradley three-pack accent table collection offers a simple way to update your living room in a way that perfectly captures the beauty of finely crafted furniture. The gentle aged look of the burnished brown finish beautifully accents the plank detailing to give these tables a warm Old World craftsman feel that is sure to fit comfortably within any home decor. With the ample storage space of the thick table tops and lower shelves, the Bradley accent table collection is as functional to your living area as they beautiful to your home. Each table is made with select veneer and hardwood solids with a gently aged and burnished brown finish. Cocktail Table: 48"W x 24"D x 20"H.
Each End Table: 22"W x 24"D x 25"H.
The Bradley 3-in-1 Pack Occasional Tables w/ Cocktail Table and 2 End Tables by Signature Design by Ashley at Michael's Furniture Warehouse in the San Fernando & Los Angeles area. Product availability may vary. Contact us for the most current availability on this product. Case Detail Angled Legs. Thick Look Tops. Plank Details.